CANDLELIGHT VIGIL - Faculty, staff and students gather around Broyhill Fountain for an April 18 candlelight vigil to mark the April 16 Virginia Tech attacks. Photo by Erik Stenbakken/For University Communications. 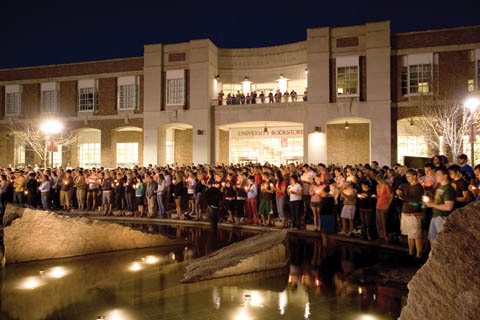 In the hours after the April 16 Virginia Tech shootings, members of the UNL Police Department pulled together. Gathering in a UNLPD conference room, campus law enforcement personnel dissected the attacks, compared early details against UNL response plans and filled walls of dry eraser boards with notes and potential procedure changes. University Communications and the UNL Police Department are developing a new computer-driven emergency alert system. UNL will offer credit courses in Chinese language as soon as Fall 2007 thanks to a new agreement that launches a Confucius Institute at UNL. UNL has also entered into a degree completion program with Xi'an Jiaotong University under which Chinese students will take their first two years at Xi'an Jiaotong and then transfer to UNL to complete their degrees. Eventually, as many as 400 Xi'an Jiaotong students could earn degrees annually from UNL. The first group enters this fall. A unique recruitment visit to Scottsbluff fourth and fifth graders has grown into a four day, four city Admissions event directed at Latino populations in Nebraska. A UNL plant scientist's discovery of a previously unknown component in plants' immune systems provides new clues to how plants and humans fend off diseases and how invaders stifle immunity. A collaborative effort has produced a DVD and resources to help graduate students deal with issues that can arise while conducting research for masters' or doctoral degrees. Before embarking on a 14-month tour of galleries across Nebraska, the 2007-2008 Nebraska Statewide exhibition, "Flow," opens in May at Sheldon Memorial Art Gallery. A compilation of animated short films from around the world opens April 27 at the Mary Riepma Ross Media Arts Center. The BFA Capstone Exhibition, featuring the work of graduating bachelor of Fine Arts studio art majors, opens April 27 and continues through May 4 in the EisentragerHoward Gallery in Richards Hall. A reception will be 5-7 p.m. May 4 in the gallery. The School of Music will present "Thoroughly Modern: A Showcase of New Musical Theatre Scenes" at 7:30 p.m. April 27 in Westbrook Music Building, room 119. Rocktavo, a men's a cappella group, will perform with The Lincoln Continentals and Three Men and a Melody at 2:30 and 7:30 p.m. April 29 in Kimball Recital Hall. The University Program Council will present a free, outdoor showing of the 2006 film "Casino Royale" at 9 p.m. April 26 at the Nebraska Union north green space. Prior to the movie, free Burger King double cheeseburgers are available to students with a valid student NCard. A fusion of dance, theater, Chinese opera, painting and sculpture is coming to the Lied Center for Performing Arts. Shen Wei Dance Arts will showcase this new art form at 7:30 p.m. April 28 at the Lied Center. Houdini never gets far from the news. There's always a movie coming out, or a book, and every other magician has to face comparison to the legendary master. Here the California poet, Kay Ryan, encapsulates the man and says something wise about celebrity.